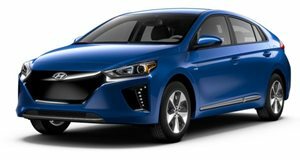 While it’s not exactly badly equipped, the entry Hyundai Ioniq Electric is fairly scant on equipment for a substantial price. Still, you get a rearview camera, seven-inch touchscreen with SiriusXM, Android Auto, and Apple CarPlay functionality, heated seats, and Hyundai’s Blue Link system with three years complimentary service. If your desire to get behind the wheel of an ioniq Electric overrides your desire for additional creature comforts, then this is your model.